AFRICAN AMERICAN REPORTS: Where was Lester Holt during the debate? 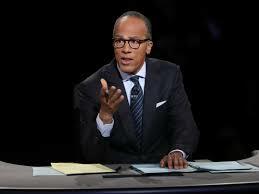 Where was Lester Holt during the debate? Over 80 million people watched the first presidential debate last night between Hillary Clinton and Donald Trump which was moderated by Lester Holt. It may surprise you that the black guy (Lester) you saw at the beginning of the show stayed there throughout the entirety of the debate. It seemed at times that he unlike the candidates was allowed a few bathroom breaks. It looked at times that Holt simply disappeared and then popped back up only to ask the next question. I'm reading online that he got relatively good praise for his job as moderator and that he stayed out of the way and let the candidates debate each other. Those giving him positive praise say that he was like a good referee in that he stayed out of the way of the action. Now I like Lester, and he is a great and respected journalist but other than letting Trump know that stop and frisk had been ruled unconstitutional and reminding Trump that he did at one time support the War in Iraq I thought Holt had left the room. If Holt had been a boxing referee, there would have been punches below the belt and ear biting with Holt showing up at the end of each round to stop the action. So what was Holt during as the two candidates went at each other? Well here's my list of things he may have been doing. He was one of the few people watching Monday Night Football. Practicing his wrestling moves while watching Monday Night Raw. Now I don't feel like Lester Holt did a bad job when he was actually moderating the debate it's just that I don't feel he did that much moderating. It would be like your manager at work saying that an employee does a good job...when they come to work.